The Guardian’s Higher Education Network recently published a guest blog post by Peter Suber, Director of the Harvard Office for Scholarly Communication and author of Open Access (MIT Press, 2012). The post debunks six common myths about open access for this year’s Open Access Week. The only way to provide open access to peer-reviewed journal articles is to publish in open access journals. 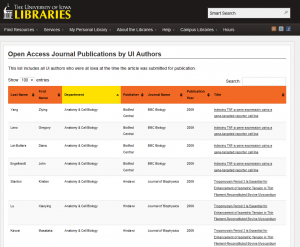 All or more open access journals charge publication fees. Most author-side fees are paid by the authors themselves. Publishing in a conventional journal closes the door on making the same work open access. Open access journals are intrinsically low in quality. Open access mandates infringe academic freedom. As Suber notes in the post, the topic of open access is becoming a mainstream issue in higher education and public policy. Given the complexity of the issue, it is important to know that facts when considering if open access is the right model for sharing scholarship. Read the post here. Articles in Inside Higher Ed and the Chronicle of Higher Education describe the MLA’s new guidelines and quote from their contents. University of Iowa Provost Barry Butler and ten other University Provosts from Big Ten institutions have issued a public statement opposing the Research Works Act and supporting taxpayer access to federally funded research results, such as that mandated by NIH. Dr. David Rosenthal, engineer and co-creater of LOCKSS (Lots of Copies Keep Stuff Safe) recently spoke on the topic of Open Access at the University of British Columbia. He choseto look at five audiences where OA may have an effect: general public, researchers, libraries, publishers, and software developers. He discusses his thoughts on peer-review or in his opinion bad peer-reviewing and whether or not open access increases or decreases bad research publishing; the creation of the big deal journal bundling by publishers to fight off the cost decrease due to the transition to Web publishing and lack of library initiative to fight off the big deals; and how the increase of OA data versus OA articles might be more beneficial for researchers. Essentially, he believes a combination of reducing publication costs, finding new technology driven publishing models, less restrictions on intellectual property and publishing of better quality articles may be the issues that face the future of research and that OA may just be a way to work on those real issues. The full transcript of this talk can be found on his blog: http://blog.dshr.org/2011/10/what-problems-does-open-access-solve.html.